A dog head collar safety lead was made specifically to compliment our Simple Leader. The Simple Leader Head Collar Safety Lead is quite simply that – a safety feature for the head collar and a lead in one. 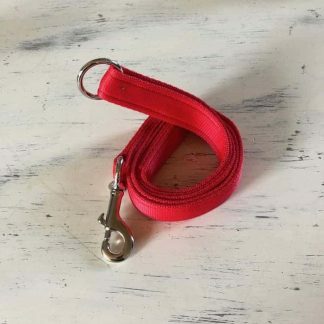 For those nervous pet parents or just for the extra safety and comfort knowing that in the unlikely event your dog slips his head collar then the lead with still be attached to your dog’s collar. 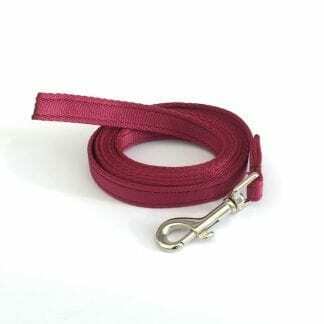 Comes in matching colours to your Simple Leader Head Collar or buy it as a stand-alone lead as it fits any head collar. Length: 1.25 metres apx, or can be custom made. A dog head collar safety lead that was made specifically to compliment our Simple Leader. The Simple Leader Head Collar Safety Lead is quite simply that – a safety feature for the head collar and a lead in one. 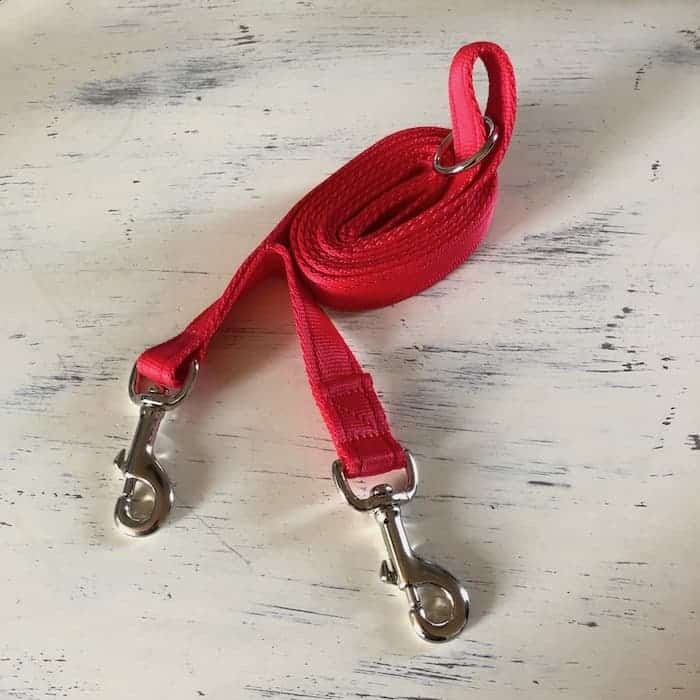 For those nervous pet parents or just for the extra safety and comfort knowing that in the unlikely event your dog slips his head collar then the lead with still be attached to your dog’s collar. 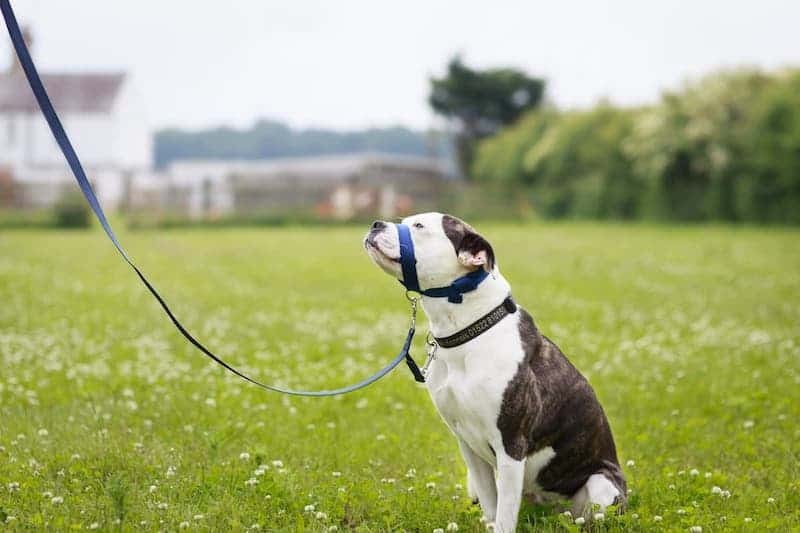 The head collar safety lead consists of a lead that attaches to both the collar and the O ring under the dog’s chin on the Simple Leader Head Collar while not deflecting from the head collars’ efficiency, however, please note it must be fitted correctly, see below. The head collar safety lead is made up of one small trigger hook and one medium trigger hook. The small trigger goes on the dog’s collar and the medium trigger goes on the dogs head collar. If you look at the image on our Head Collar safety Lead, it explains how the lead must be fitted to get optimum effectiveness from the product. If the lead is not pulling from the head collar but in fact pulling from the collar, the head collars effectiveness is significantly reduced. Do some positive reinforcement training, if you are unsure what to do, contact a trainer near you for advice. (Advice notes coming soon). Make sure it is snug enough. Lose fitting training collars like head collars do not work at their best if they are loose fitting. 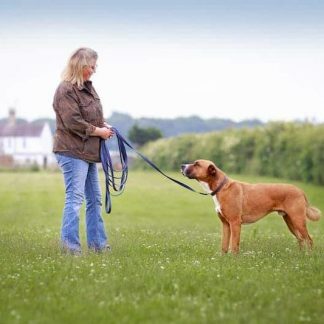 Have your dog wear the Simple Leader when you do not need to walk him, have them sit in a relaxed manner with the Simple Leader on and drip feed him small treats, then take the head collar off. You could even try feeding your dog with the Simple Leader on and then take it off. If you are unsure about the safety of head collars please consider buying our dog head collar safety lead as this gives added security. Please NEVER use any head collar with long leads and never long training leads as the risk of injury is too high. 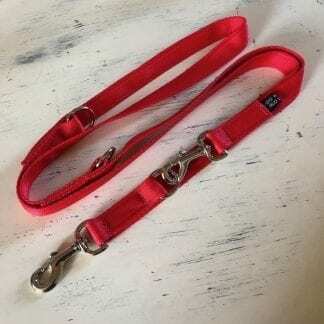 Our dog head collar safety lead comes in one length only as we believe that it is the only safe length that it can be used at. At last! I’ve been looking for some time for this type of dog lead. Two triggers on one lead make such a difference and gives me the confidence & security that my dogs are safe. After a quick phone call to discuss my needs I ordered the leads on line and received them within 2 days – super, efficient service, thank you so much!! Thanks Sharon, glad you’re happy. Purchased this along with the head leader as recommended as I was worried about the possibility of my mums dog backing out of the head leader, which might I add is a risk with a lot of head collars. This compliments the head leader well and gives my mum confidence and the security that if he backs out then he is still safe and under her control. A great addition to the range. Good quality and very speedy service, ordered on the Monday and ready on the Wednesday, what more can you ask for.